Idyllic chalet with three bedrooms, two bathrooms, kitchen and terraces. The superbly light bedroom 1 has a view over the valley to the Mediterranean, Gibraltar and Africa. All bedrooms are elegantly decorated. The lounge has an open fire place and a wood burning stove. Additionally the whole house is equipped with electric radiators for the winter months. The cottage is fully equipped as listed, the kitchen, a comfortable area for meals with seating for up to five people. The living room area has two large sofas, books and a CD/MP3 player with USB/Aux Input so bring along your iPod or laptop and enjoy your own music or browse the internet, as there is unlimited internet access. Both the main house and the studio cottage have access to the gardens and the beautiful pool of the property. This charming cottage is located in grounds of a well established Mediterranean garden with olive and almond trees, which also provide shade and coolness during the summer months. Steps leading up to the pool with lighting for a perfect summer nights dip and patio with magnificent views across to the cliffs of Gibraltar and Africa. It is located on the 'Puerto de la Cruz' property on a slope in a forested valley of mountainous limestone only five minutes walk from the white village of Casares. Casa Ceramica is within a short distance of the beach, Gibraltar and if you care to venture further for cultural interests Ronda, Jerez, Seville, Granada and Cadiz. Pool measurements: 3 meters by 5,50 meters and 1,50 deep. We've discovered a little gem of a place! What a find! We spent a week at Casa Ceramica in July 2017 - myself, husband and three sons (aged 7, 14 and 16). The cottage, although cosy, was roomy enough for all five of us (one double, one twin and one single room). We were able to eat in the kitchen (when it was too windy) or down on the terrace. Shirley was a fabulous host and was really helpful with things to do and see in the area and we loved hearing about her life in Spain. Shirley's garden is magical and I could have spent hours exploring it. The pool is on the small side but lovely and perfectly big enough to cool off in with a big enough area around it and sun beds for the whole family to lounge around. The cottage is well equipped and in good condition - there is washing machine and an orange squeezer so we had delicious fresh orange juice every morning for breakfast. The highlight, though, was sitting/dining/drinking on the terrace with the most fabulous view down a wild valley to the coast, over the Mediterranean and to Africa - honestly the best views I've ever had from a holiday house - and watching a family of Griffin Vultures (with binoculars thoughtfully provided with the house) nest on the cliff opposite was very special and had the boys fascinated! The location is ideal - the village can be got to on foot in less than ten minutes (a good choice of bars & restaurants, as well as a small supermarket & pharmacy), and one can also access many walking trails directly from the cottage. The coast is a short drive away for those who wish for a bit of an urban fix, and equally the beautiful Andalusian hinterland and the Pueblos Blancos are just a short drive away too. I would highly recommend this holiday let. It wouldn't be suitable for small children (too many drops and little winding paths). Being slightly elevated and away from the coast which means that in very hot weather this location is slightly cooler and you tend to get a good breeze coming up from the coast. A haven of peace and quiet but not too far from the action either. A great place for a summer visit to relax and enjoy the small pool and watch to vultures gliding in the thermals. 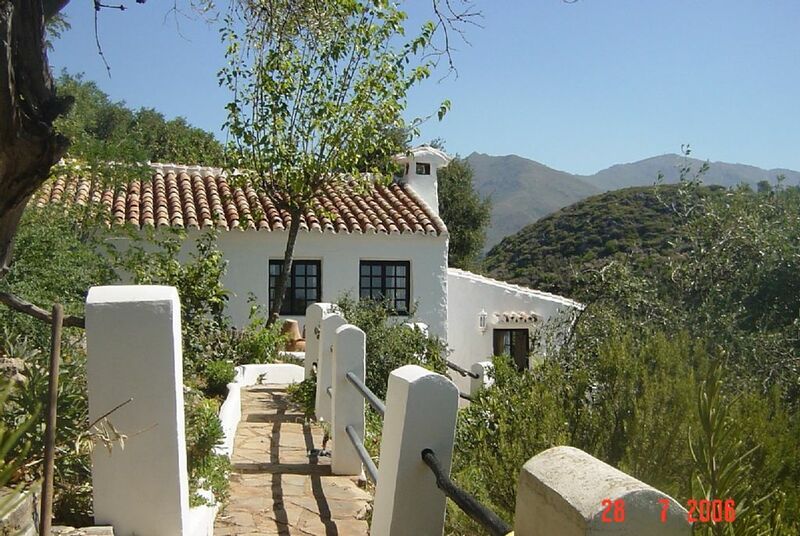 Walking distance of Casares and only 15 minutes to the coast. In the cooler months the walking looks good. The bathrooms are a little tired but functional. We were met by very pleasant owner who had left a very generous amount of food for us. Two adults and three pretty much grown up teenagers were very comfortable. Very clean, tasteful and new furnishings. A genuine ten minute walk to the very pretty town. twenty minute drive to beach and supermarkets. An hour to Malaga a bit more to the stunning town of Ronda. Best bit by far is the location perched on the edge of a hill we spent hours watching the vultures soar in front of us as they fed their chicks visible on on precarious nests.. Gardens are lovely. Our best Spanish villa so far. The cottage is a few minutes walk from the picturesque white village of Casares, the most photographed of Andalucia, with it's labyrinthine lanes and streets distinctive of it's Moorish heritage. The many local restaurants and tapas bars enhance the real Spanish experience. Take a stroll to the Moorish castle which over looks the village. Casares is an excellent base from which to explore Andalucia placed between the mountainous limestone range of Serranía de Ronda, the Straits of Gibralter and the coast offering a diversity of delightful landscapes, untouched nature and many local activities such as horse back riding, golf, bird watching, local walks and spanish cultural events and markets nearby.